In the Kagoshima prefecture which has been blessed with sea products, there are many famous sushi restaurants. If you would like to enjoy the fresh fish and shellfish, this sushi is the best! But you may think where I should go in order to come across my favourite sushi. Well, I’m introducing the carefully selected well-known restaurants to which the locals go. 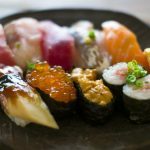 They are the top 10 sushi restaurants graded by ranking which I want you to visit on your holiday to Kagoshima! Please refer to this article and enjoy the sushi. 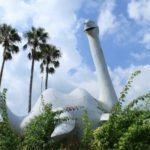 Originally, it was opened on the site of the Kagoshima-city fish-market 50 years ago and it has been loved by the authorized market people as well as the locals. 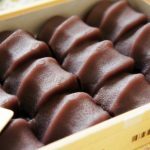 Later on, it was moved to the bustling street in Kagoshima, Tenmonkan and it has been establishing its popularity as the delicious sushi restaurant among the sightseers from outside the prefecture. 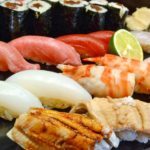 All sushi are exquisite, focusing on the fresh local fish and shellfish directly delivered from the market and they are reasonable in price as well. If you want to enjoy the sushi more economically, the lunch time is recommended. Starting with nigiri (hand shaped sushi) the [Ichiba-set menu] with sashimi (raw fish), tempura (fried fish and vegetables) and chawanmushi (steamed egg custard) is a substantial meal for ￥2,500. You can also have the tempura-set, the boiled-fish-set and the sushi-set for ￥1,000 each to fill your stomach. 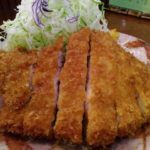 If you go on a night out, how about having the Kagoshima local cuisine together with the alcoholic drink?There are plenty of gourmets such as kibinago (silver-stripe round herring), katsuo (bonito), tonkotsu (pork-bone) and home-made satsuma-age (deep-fried minced fish and vegetables) which only Kagoshima can offer. The inviting cat, raising its right hand in front of the restaurant is the salesman of the [Ichiba-shokudou]. That’s the land-mark to find this restaurant. It is the restaurant in Makurazaki which the owner who has been trained in Osaka has opened. It is popular among the locals as well as sightseers. Starting with the bonito landing at the Makurazaki fishing port, they use the seasonal fresh fish and shellfish such as the horse mackerel and the mackerel. Especially, you can’t ignore the mackerels at Makurazaki! You can taste the sashimi with the vivid red colour, the heart of mackerel skewer which is called chinshi and tempura. 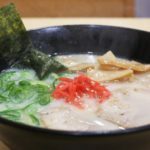 The home-made buckwheat noodles with the soup using the high-grade dried bonito are also popular.It is recommended that you should have the bigger sushi than the ones at other restaurants, after searching for one in the water tank in front of the counter and asking for the chef’s recommendation. As it is often very crowded, it would be better to book a table in advance. The [Makurazaki Katsuo Funabito Meshi] was inducted into the Gourmet Hall of Fame after winning in the Show-1Granpri in 2011 and 2012 consecutively which decided the gourmet No.1 out of all the shopping streets in the Kagoshima prefecture. You can luckily taste it! It is a new local gourmet in which the fishermen’s meal on the boat has been arranged into a modern style. You can have one at the 9 different restaurants in the Kagoshima-city and the flavour and the toppings differ depending on the restaurant. It would be interesting to have an eating comparison. It is located in the middle of Tenmonkan and you can enjoy the full scale sushi, using the seasonal fish and shellfish. It is the restaurant to visit when you want to have sushi in a little luxurious atmosphere. The restaurant has the chic and composed atmosphere and the counter is a solid white plank one. They have the private rooms, but you should enjoy the chef’s skilful manipulation just in front of your eyes, sitting at the counter. The sushi is focused on the course menu, using the fresh seasonal fish and shellfish which has been caught in the home waters. The chef’s choice, nigiri (hand shaped sushi) is ￥6,000 and the one with the nibbles with a drink is ￥8,000. Their plates for sushi or nibbles and the Satsuma-kiriko glasses (cut glass) as well as the larger-sized cup for sake are all sophisticated. If you want to have the delicious sushi in Kagoshima, this restaurant is the answer. 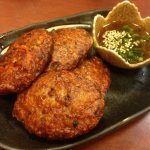 The [Eguchi-houraikan] has been selling the fish and shellfish landed at the Eguchi fishing-port, the local fresh vegetables and the processed food. It is proud of its top-class customers in number among the similar facilities in the Kagoshima prefecture. On Saturdays, Sundays and the national holidays, there is traffic congestion to enter their parking area. Since its opening, not only the locals but also the sightseers from outside the prefecture drop in when they are cut on a drive. It’s a convenient facility for enjoying both a meal and shopping. Especially, the restaurant is located at the best place from where you can command a view of the Eastern China Sea. They have been buying in the fresh fish and shellfish which has been landed at the Eguchi fishing-port. They are particular about the local production as well as consumption and the menu which is focused on the local fish is popular. The [Hourai-nigiri] is a set-menu with 100% of local fish which were bought at the Eguchi fishing-port. As the number of the dishes is limited, you’ll be lucky if you are able to taste one. During the season for the red sea-bream, the [Sea-bream-chirashi-don] is offered. The other menus such as the sashimi-set or the tempura one have a variety. It is recommended that you should avoid the lunch time at the weekends or the consecutive holidays, as it is very crowded. Speaking of sushi in Kagoshima, the name of this restaurant comes up without fail. It is a reservation-only and chef’s choice-only restaurant. They are buying the carefully chosen seasonal ingredients, focusing on the fish and shellfish caught in the home waters of Kagoshima. Sometimes they buy them directly from the fishermen. They only have the counter-seats and the atmosphere with the jazz music at the background seems like a fashionable bar rather than a sushi restaurant. As they offer various ingredients, the size of each sushi is smaller than the general ones. Especially, it could suit females. The stock of the Japanese sake has a variety, so the chef chooses the particular one for the particular sushi. Everything is different from the ordinary sushi restaurants. The owner has been committing to his own style. The owner’s hands change the fresh fish and shell-fish landed on the day into the showy sushi and the nibbles. 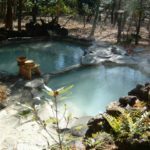 Why don’t you visit there and spend the most luxurious time in Kagoshima? This is the delicious Japanese dish restaurant which was opened in 1960. It started from the small sushi shop named, [Sennarizushi]. 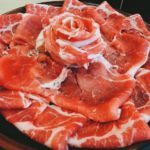 You can enjoy the taste of the long-established restaurant where the traditional skills as well as the tastes were handed over since its opening. The locals use this restaurant for the family or relatives gathering or as the place for some celebration. It is a very handy restaurant. They cook the seasonal fish, focusing on the local fish and shellfish into the delicious dishes. The nigiri (hand shaped sushi) set is ￥1,000 ~￥2,000 which will satisfy you. You can also have the items using the seasonal ingredients such as the lobster-dish, the Bateira (pressed mackerel sushi) which is cooked using the thick mackerel meat as a crucial factor and the grilled eel with the secret sauce. Inside the restaurant, there is a big fish preservation water tank and there are the table-seats as well as a big hall to cater for large numbers of people. So, it suits a family or a group outing. They have various types of shochu (spirit distilled from potatoes) and Japanese sake which is good news for sake lovers. The Kanoya-kouku-kichi Air Base Data Museum is nearby. Why don’t you drop in? 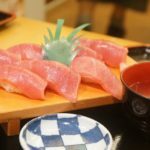 The [Isshinzushi Koyo] which is famous sushi restaurant in Miyazaki is their parents’ home and the brothers have become independent from them and have opened their restaurant for sushi and Japanese cuisine in Kagoshima. Since its opening in 2015, the fans have been rapidly increasing due to the way they work. The older brother is in charge of Japanese cuisine and the younger one in sushi. The first class skill of each one is shown in the dishes and you can physically feel the enjoyment of eating. The elaborate dishes are coming out one after another. The selection of the plates is attractive, so you can enjoy them with your eyes as well. They choose the best champagne or Japanese sake for you depending on the dish. However, it is difficult to make a reservation, as it is super popular. It has been fully booked until a half year ahead. I’d like to be soaked in the quintessence of the Japanese cuisine which is performed by the brothers, sitting at the counter. 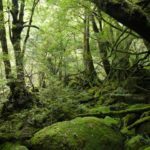 The Nagashimacho is located at the Northern-west part of the Kagoshima prefecture. It is the island with the mild climate which is connected to the Kagoshima prefecture main land by the Kuronoseto-ohashi (bridge). The cultivation of yellowtails on this island is the best in Japan and the surroundings of the island, starting with the Kuronoseto channel, are full of nature in which the high quality fish grow. The [Azumazushi] has been preparing the inshore fish focusing on the freshness. The owner is a broker at the local fish market, so every morning he carefully selects fish and shellfish.His motto is the freshness and seasonal in order to provide a meal safely and securely. Each menu is his best work. The menu has a variety such as sushi, sashimi, simmered foods and tempura. The lunch is ￥1,500, starting with sashimi bowl of rice and a set-menu. In the evening, let’s enjoy the chef’s choice with the alcoholic drinks. Nagashimacho is famous for the shochu (spirit distilled from Potatoes) named [Satsumajima Bijin]! If you use a ferry, you can go to Kumammoto or Amakusa from Nagashimacho. It is just good for a drive out. The Honten (head restaurant) started its business in Tenmonkan in 1948. It is one of the sushi restaurants with a long history in the Kagoshima-city. Having said that, it doesn’t make you feel hesitant to visit and go there freely. Their branches are in the Yamagataya department-store which is the purveyor to the Kagoshima local people and in the basement of the terminal-bld. in front of the Kagoshima-chuo station. They are in the convenient places to access on the way of sightseeing. They buy the freshly caught local fish, making a successful bid at the market, being particular about the best season and the freshness. Using the rice produced in Kagoshima, they finish off to make the most exquisite sushi. 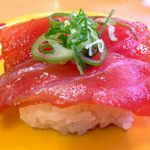 At Kikakuzushi, the tuna is especially recommended. Every Friday, the live tuna is directly delivered from the Amami island. They buy the whole tuna, so you can enjoy various parts of it. You can have the boiled eyes and the dish using the flesh of the cheek of the tuna on Saturdays and on Mondays which is called the [day for fat-tune] you can have the fatty-tuna and the medium fatty-tuna for a bargain price. You can’t ignore the local fish such as snake mackerel, oval squid and red sea-urchin! Please try the original shochu (spirit distilled from potatoes) or the famous product- home-made glue-plant buckwheat noodles. The restaurant is located at the place which is an 8-minute-walk from the JR Kokubu station. In the Kagoshima prefecture, the sushi restaurants are concentrated in the Kagoshima-city, but this restaurant is famous locally, as their sushi is as good as the ones in the city in terms of the quality.They are particular about the local fish and shellfish and buy the season’s best fresh fish and shellfish from the home waters directly from the fishermen. They always offer the best fish on the day, so some people come and taste their sushi all the way coming from the Kagoshima-city. They are fussy about the details, nevertheless, they are reasonable in price. The special nigiri (hand shaped sushi) is ￥2,500. The ingredients are similar to the ones at other restaurants, but the price is about a half. You can eat them until your stomach is full without worries about the money. The sea-urchin seems to be very popular for the repeaters, so, if you are a sea-urchin lover, please check it out. Let’s eat the delicious sushi in the Kagoshima prefecture. There are various types of sushi restaurant from the first-class one which makes one feel hesitant due to the price to the one in the towns where you can drop in without any sense of hesitation. Each one of them differs in terms of the purchase of fish and shellfish, their skills, the appearance of the restaurant and the choice of the plates. It is a great pleasure that you can enjoy the difference depending on the restaurant or the season. Please enjoy the superb sushi in Kagoshima where the restaurants are all famous ones. Deiliver the SeeingJapan's news to you! Please share this article for your friends! The 10 Best Places to See Autumn leaves in Kyushu, Japan!